Pass your exam with an AssociatePI Comprehensive Online Course or your full money back, guaranteed. Please see below for money back guarantee requirements. 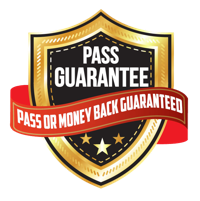 We are so confident that you will pass your exam that we offer a money back guarantee. Pass your exam with the AssociatePI Comprehensive Course or your full money back, guaranteed. The requirements to receive your money back are simple, you just have to study. Note – this offer is for Comprehensive Courses only. This offer is not valid for practice exam courses or free trial courses. Must have fully completed the Comprehensive online course prior to your exam date. Must have fully completed the Comprehensive fill-in-the-blank study guide prior to your exam date. Must have completed each recap quiz prior to your exam date. Must have completed each practice exam prior to your exam date. If you fail, here’s what you must do for reimbursement: Simply email us. To receive your money back, you must have fully completed the course, fully completed the quizzes, and fully completed the fill in the blank study guide. These three aspects of the course are crucial to passing your exam. Proof of completed course, quiz, and practice exam – Our systems track which steps in your course have been completed. Upon reimbursement request, we will verify with our system that you completed each unit in the course, each recap quiz, and each practice exam prior to your exam date. Proof of study guide– You must provide proof that your study guide has been completed. Proof can be submitted through email, as a scanned copy if your notes are hand-written, or as a PDF if your notes are typed. Proof of failure – If you fail your exam you will receive a document from the testing center declaring that you did not pass. This notice will also be posted to your account at The Institutes. Please scan, take a picture, or take a screenshot of this proof of failure and email the proof to AssociatePI. In your screenshot, please be sure to capture the test date, tester’s name, and non-passing notice. The refund will show in your account within one to two weeks. Once the refund is processed, you will no longer have access to the course. You have the option to choose the refund or remain enrolled in the course.